• PLOT SUMMARY: Original Sin: Part 1 - WHAT IS THE SECRET REASON WOLVERINE JOINED THE X-MEN? The X-Men event of the fall begins in this one-shot! For years, Logan has been a man without a past, whose memories existed only as conflicting fragments. And Charles Xavier has been a master of his own mind and others. 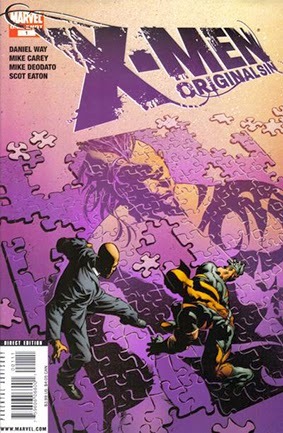 Now the tables are turned, and as WOLVERINE struggles to rescue his son, DAKEN, from the evil and darkness that have consumed him, PROFESSOR X comes face-to-face with the most terrifying secret of all! Beginning here and continuing in the pages of X-MEN LEGACY and WOLVERINE: ORIGINS this month and next, ORIGINAL SIN is sure to turn your expectations on their head! This issue also includes a reprint of "First Night" by Chris Claremont & John Bolton from Classic X-Men #1. Written by MIKE CAREY & DANIEL WAY. Penciled by MIKE DEODATO & SCOT EATON. Cover by MIKE DEODATO & RICHARD ISANOVE.